For any avid fans of Dark Souls whom are looking for my interpretation of the story in any of the Souls games, I’ll save you the trouble now of reading: I will not be laying out the story. I have failed you. What I want to talk about is the way that Dark Souls tells a story and how I have borrowed it’s method when it comes to it’s unique way of telling a story. It’s story is equal parts narrative, exploration, and revelation. You can play and enjoy the entire game without ever asking any questions. Dark Souls compelling game play basically distills down to “get good.” Each enemy, no matter how menial, is dangerous. You must learn to fight each enemy, gauge the terrain, find the exploits, and defeat those in your way. It is a very difficult game, but the reward is that fist pumping excitement when you finally grasp victory. The game does an amazing job of making you feel like you accomplished something. Here is a question I started asking myself about halfway through Dark Souls: why do I need to link the fires? You start to notice that enemies and areas aren’t ambiguously named. There aren’t places like “The Dark Forest” or “The Forgotten Castle.” Locations and (most) bosses have distinct names and titles like Ornstein and Smough, Seath the Scaleless, Crossbread Priscilla, and Dark Sun Gyndolin, just to name a few. If you pay attention to the environment and start to pour through descriptions on your items (sneaky bastards) you can start to piece things together. It may seem as though a lot of these areas are simply slapped together for game play sake, but the writers behind Dark Souls had a definite, clear story in mind for the game; you just need to dig it up. The only reason I think this method works is because they made double sure that you don’t have to know it at all to play the game. The game itself is about combat and exploration, and they put a lot of time creating a rich, cohesive world to run around. It feels like a 3D Metroidvania game: massive, sprawling segments with things to find and secrets to uncover. Diving deep into one area to find the key to unlock another. Pathways that wind back into themselves to create this sense that everything is connected (sometimes literally). For many people, I understand that having to find the story seems ludicrous. But what really works for me is the fact that I didn’t even know the story was there, and I got to have that feeling of satisfaction of slotting pieces together and realizing what happened. There is no greater feeling of excitement and urgency than realizing midway through a segment that you know what happened, and you suddenly see everything with a new gaze. 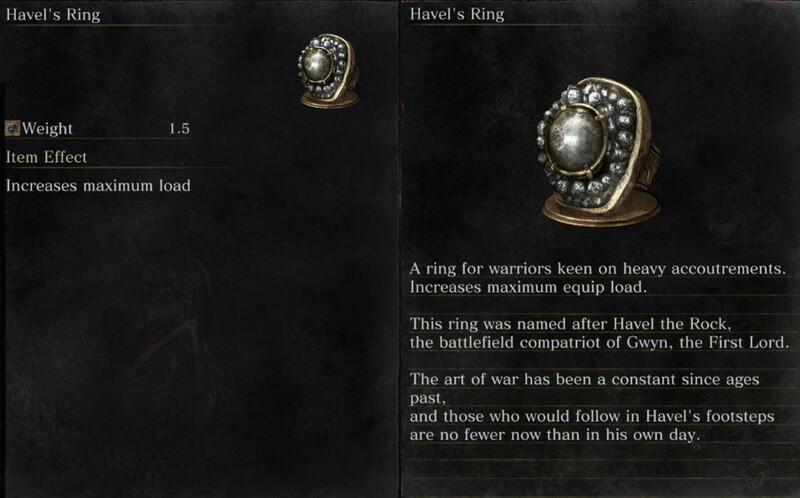 You get this ring after defeating Havel in Dark Souls. He’s not actually a boss, just a heavy plated knight at the base of a tower. Almost innocuous. You wouldn’t have known he was important unless you got his equipment. Each item has a description like above: it tells you immediately what it does, and then if you are interested, it tells you a little about the wearer or the world surrounding it. You find out that the knight was named Havel, and he fought alongside—wait, Gwyn the First Lord? And then more questions fill your mind: what the hell was Havel doing at the base of that tower? What was he guarding? Why is he here? And where is Gwyn? Eventually you find other items that begin to fill you in on what happened. And this happens for any number of bosses, characters, or areas until you have a complete, albeit hazy understanding of what happened. Your exploration and determination uncovered the mystery. It’s really satisfying. And then you start to realize that the environment is also telling you a story. There is a castle full of undead soldiers and barricades trying to keep something out, but what were they fighting against? There is the abandoned city of Anor Londo: where did everyone go? What is this massive library apart from the city for? What were they studying? The scope of the games becomes much more enjoyable when you realize that nearly every single thing matters to the narrative hidden beneath the surface. Things as simple as “What is this monster from the first area doing in the last area?” become massive clues to the world and story at large. Many games have done this. Filling you in on tidbits of history with item descriptions. Dark Souls wastes nothing, not even these descriptions. Armor sets usually tell you a tiny bit about other countries, establishing the world at large. Weapons might tell you about the bearer and why they have this. Some tell you about how characters knew one another. The more you collect and observe, the more you understand the world around you, and no one had to fill you in in a cut scene. I can’t really full explain it unless you are already excited about the Souls games, so I’ll save you the gush. But what has affected me the most from these games is how I want to tell a story. I have been accidentally doing this in Rogue Trader; I try and build backstories for basically every important NPC I create, and I keep this information up to date on a wiki for my players.. I put extra information on the wiki so that my players can go read more about what they are doing, and maybe sprinkle in a couple of questions they could be asking. This has been my emphasis for my proprietary DnD realm I’m building. I want each area to have the quest, but also have enough of a story written into the details that the players can basically locate secret objectives. I want the world to feel rich with mystery, because the feeling of discovery is awesome. A haven’t really experienced this much as a player outside of video games and some books. But I want to encompass that feeling in Rogue Trader and my story writing, that feeling of exploration, discovery, and revelation. I will endeavor to continue and I will always look to Dark Souls for inspiration because the feeling I got while playing that game is irreplaceable. This entry was tagged Daniel, Dark Souls, Discovery, Experiences, Storytelling. Bookmark the permalink.